When a dog can outperform you in any random task, it's probably time to reevaluate your life's decisions. And when a dog can outperform you in saving another person's life, then it's probably wise to take stock of every waking moment heretofore spent squandering your potential. 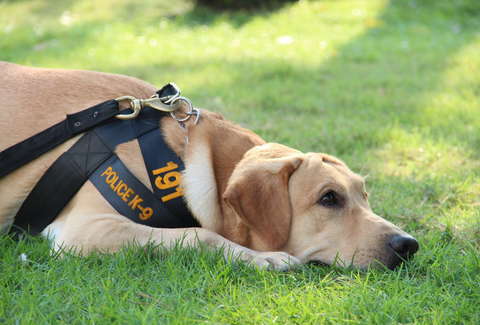 Poncho is a dog employed by the Madrid Police, and he's expertly trained in CPR. He's like Lassie, only more Spanish and well-versed in law enforcement protocol. In a video released on the Policía de Madrid's Twitter account, Poncho demonstrates his skills by jumping onto a policeman's chest and applying the requisite resuscitative techniques. He is a hero among his canine brethren. “The dog is the only being in the world that will love you more than you love yourself,” the caption affectionately reads, according to TIME. In the training exercise, Poncho puts his full body weight on the officer's chest, jumping up and down to simulate the rhythmic chest-pumping characteristic of CPR. He even checks the officer's pulse by placing his snout on his neck, basically begging to wear a dog-appropriate stethoscope. Poncho is not the only dog who knows how to revive a human on the brink of death. Other dogs have been trained in CPR as well, but they face stiff competition from Poncho who is clearly a very good boy and also a leader of men.